Thankfully I am currently hitting an easier patch of games now so the progress on this resolution should pick up a little before it dies down again. Which I suppose is good because next week I'm going to be back in college and working on my associates degree. Still for the time being Ill be focusing my attention on this resolution as well as Mega Man series for a little while. Only 51 more to go people and 10 more months after this one! Mega man 8 is another game that I have been holding off on for a number of reasons, but after beating Mega Man and Bass I can finally continue and beat this game. See I am playing the Mega Man classic games in reverse order because my first entry was 9, and aside from a few mishaps, Mega Man 10 being released, I have been trying to stick to this plan. But the other thing that kept me from playing 8 was the levels themselves. There is just something about 8�s levels that bug me, either how long they are or the checkpoint system on them, either way I just kinda stopped playing after beating Astro Man, which I recall was insanely hard for me, as I didn�t have the homing sniper at the time. Well when I picked it back up I have to say I enjoyed it more than I remember enjoying it and aside from the usual parts I kept dying on I was working my way pretty fast across the remaining levels, then Wily Stage I happened! I was already informed that this stage was annoying and it didn�t disappoint, constantly hearing �SLIDE SLIDE JUMP JUMP SLIDE JUMP� started to really piss me off. But what really got me angry was the fact they don�t even tell you correctly when to slide or jump, once you hear jump you want to jump, but the problem with this is that the screen can�t keep up with you and the platform that is about to appear doesn't so you will end up jumping to early and barely miss the platform. In fact the easiest way to do it was just know when you had to jump and slide and ignore the signs telling you what to do, hence making this part a very big trial and error. I honestly doubt anyone could pass it their first time. Aside from Wily Stage I, the rest of the game was fun and like the Mega Man I know today. The Wily Stages were a good length compared to the rest of the game and honestly made me like it a lot more in the end. Wily wasn�t a big problem, but I still miss my E tanks. After I won I remembered why the cutscenes were so bad, the voice acting is terrible, just pure crap, and with that sober note I ended Mega Man 8. Conclusion: Despite some levels being too long, and Wily Stage I, Mega Man 8 is a decent game. It isn�t as good as some of the other games in the series but it certainly isn�t terrible. Everything is quite doable and in the end it�s a fun ride, and only remembered perhaps by its terrible voice acting. Having finally beat FFVI as one of my first of 60 games I mean to accomplish I can finally restart my Final Fantasy train to discover more about the series and thus leads me to FFII. See I have beaten all the games that came out to North America to give me a sense of what it was like to be a NA Final Fantasy fan, playing the games FF, FFIV, and FFVI because they were released while FFII, FFIII, and FFV were not yet stateside. I know that FFVII came right after VI, but considering VII was a turning point in the series I want to experience the first half before I get onto the second. 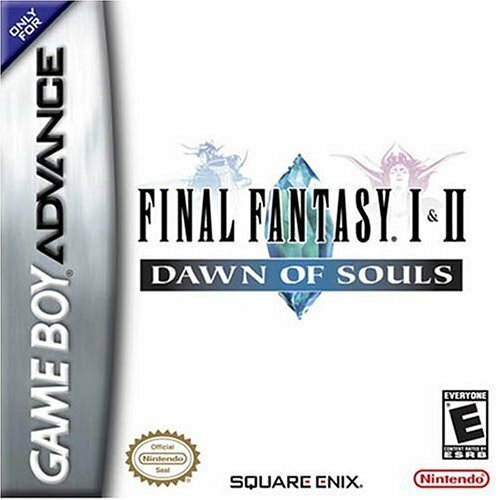 Thus leading me to Final Fantasy II and to a lesser extent, Souls of Rebirth. Starting out FFII I have to say I don�t like how they surprise you with hard monsters if you make a wrong turn. I understand it�s a turret to keep you from exploring everywhere right away and giving you a sense of direction, but I find it very off putting that there is no way for me to escape or survive if I accidentally go where I shouldn�t, thus losing unsaved progress. Other than that, well I love the skill based system, admittedly it involves grinding but honestly it makes a lot of sense and lets me plan my characters how I want. It�s only logical that a character gets better the more they use a spell or weapon. The music was lackluster compared to the original or IV, but the story was better than the original so I suppose it�s a trade off. As for the characters, they are more or less there and really the only character you really get are any sense of are the side characters that join your party, although I have to say the Emperor is an awesome villain if only for the fact he dies on purpose to conquer both worlds in the afterlife. As for the extra chapter you get after beating FFII, Souls of Rebirth I have to say it�s quite annoying. Considering the fact they give you all the side characters that die during the quest, ones you�re not likely to train or give an afterthought to considering if they may be useful again, it makes things quite difficult to begin. So by giving us some rather useless characters in a dungeon that is just as hard as the last one you just faced in FFII things get out of hand fast. It�s not even harder, but more so bad luck that you�re always up against. And till you are able to become a decent level so you can handle yourself, you still have two more places to go to finish the chapter. Really SoR just feels very unfair in the beginning and it would have been nice if they gave some sort of warning or help along the way. Put really it just comes down to "grind to survive". It�s not even that this little chapter is bad either, I like the idea, the fact there is a parallel between you and your party in FFII, but given the situation it just tends to piss me off more than make me enjoyed by the time I'm done. It�s certainly challenging, but in a bad way, and just by giving a little aid to players in the beginning would have made this whole chapter a lot easier to bear. Conclusion: I like Final Fantasy II, and I�m sure it�s because of the skill based system. The story is promising from such an old fossil of a game, but nothing compared to later entries. In the end it feels exactly like a step up from the Original, but not exactly a classic like the original. Souls of Rebirth is also a nice addition to FFII, expanding upon its universe, but in the end it just comes out like a bad hand in poker. So after finally beating MM8 I am able to go down the list of the other Mega Man games that I haven�t beat yet and 7 is the next one considering that I am going in reverse order. For the most part 7 was the usual fare and frankly enjoyed it so much more than I did 8 or Mega Man and Bass. The music was catchy, the stages weren�t too long and the robot masters were nice. I was able to identify the patterns pretty easily and get all the RUSH plates to form the super adapter, which was pretty cool. I also like the fact that the buster is not only less annoying when charged, but its weakened compared to other installments. I pretty much blazed through this game though, but I'm fine with that considering I have a long way to go and knowing that I have other Mega Man games to go through gives me some sense of hope in reaching my goal. It�s not even because the game is easy either, in fact I think most of the robot masters in this game are tough to manage, but when you�re good at one Mega Man game you are pretty much good at all of them. Even Wily�s Second form wasn�t much trouble as long as you have enough E tanks and learn how to use W. Coil properly. It was rather embarrassing to find out you have to hold the up button to make them go higher, talk about a big slap in the face! But really what it comes down to why I like this game so much compared to the other two 16 bit games is that Mega Man 7 gave me what I love about Mega Man. Good music, fast pace gameplay, and something that I can play again and again. I know most people out there want each game to be a bit different and have vast improves either graphically or via gameplay, but Mega Man should always have that same type of game play to me, no fancy tricks like in 8 or Bass. 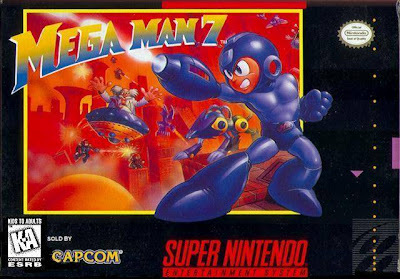 Conclusion: Mega man 7 surprised me, after playing both 16 bit Mega Man games I thought I wasn�t going to like any Mega Man game that was a bit over 8, but 7 proved me wrong! The music is wonderful, the bosses are challenging and it�s something that I can play thru over and over again. Mega Man 7 represents what I love about Mega Man, and although it isn�t the best at it, it�s still pretty good for what it does.